Read this article 'Sanju Samson – The shining star of Kerala'. This article reveals the entire history of an upcoming cricket super star from Kerala Sanju Samson. He has now become a threat for other international players. He has impressed our senior players so well that Sreesanth and Sachin Baby could hardly get a chance. See how he managed to become a junior master blaster and how his coach Sujith Somasunder from Kerala helped him. 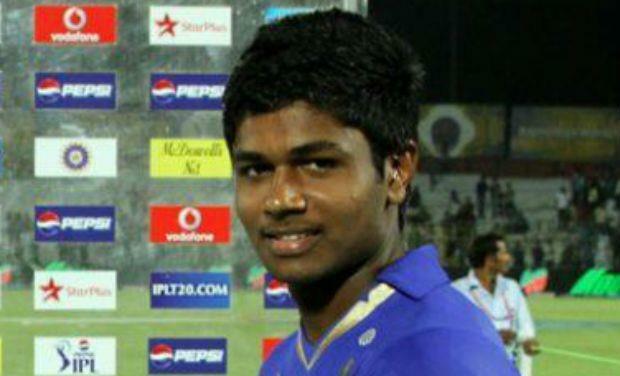 Sanju Viswanath Samson commonly called as Sanju Samson was born on 11th November 1994 in Vizhinjam in Trivandrum district, Kerala. Samson Viswanath was his father and he had played the Santhosh Trophy football tournament for Delhi. He is also a retired police constable. His brother Sally.V.Samson has also taken cricket as his profession. Sanju wishes to bring up the name of Kerala to great heights through him. By 3rd November 2011, Sanju made his debut in first class cricket for Kerala and was the youngest to play. His Domestic seasons against Delhi were very much impressive. He scored a total of 722 runs including two centuries in just 10 innings. Sujiith Somasunder was Sanju’s coach who had played India in 1996 and is now the coach of Kerala. He always had a great vision towards this young guy. Somasunder shares lots of his thoughts on our new players. From the words of Somasunder “Sanju is a talented, focused and dedicated person. His simple attitude and positive approach towards his career impressed me very much. He doesn’t waste any chances put forward to him. For a player to succeed in his career, he should develop lots of shots which are not written in the book of cricket." The 2013 Pepsi IPL have given a great platform for the new players. Sanju Samson is one of them who is playing for the Rajasthan Royals and has shown that Kerala is also filled with lots of talented players. By this age he has achieved a great place in the hearts of all cricket lovers. People have even decided to make fans association for him. At the beginning Sanju was the member of Kolkata Knight Riders for the 2012 DLF IPL, but failed to play a match. He then signed up for the 2013 Pepsi IPL and then luck went in his direction. As Sanju was a wicket keeping batsman and Rajasthan Royal's regular keeper Dishant Yagnik was injured, Royals had no option but to give Sanju a chance for the match against Kings XI Punjab. He took the full benefit of the chance. In that match, his 27 runs off 23 balls and 47 run partnership with Rahane gave Rajasthan a dominating victory. Captain Rahul Dravid was really impressed with the performance of the young boy and decided to give him more chance. Sanju capitalized on all the opportunities placed in front of him. In his second match against Royal Challengers Bangalore, he scored 63 off just 41 balls lead Royals to a royal victory. He was awarded the man of the match for his excellent knock and it was a turning point for him in his career. He hits two consecutive sixes in the respective innings of Murali Karthik's delivery and removed a huge pressure from RR. By that knock he broke the previous record of Shreevats Goswami for becoming the youngest player to score a half century at the age of 18. He kept his good form continuing in his next match against KKR in which he scored 40 runs off 36 balls in Eden Gardens. He said that it's a dream come true to play an international match in Eden Gardens. Even though KKR won that match comfortably, Sanju's knock was the tacking point for the Royals in that match. His fourth match was against Pune Warriors India in which he contributed well to bring a victory to his side. He was awarded the 'star plus Naya Soch Award' for his overall talent. Then on 9th-may-2013 comes a match between Kings XI Punjab and Rajasthan Royals. His unbroken partnership of 76 runs off just 56 balls and contributed 47 runs off 33 balls in it. Sanju hits the winning runs in style by hitting a boundary through the extra cover and gave the RR's yet another emphatic victory. There is no doubt that his presence had made Rajasthan a stronger team from a depriving position. Indian legend Sunil Gawaskar said that he could see a new Sachin in him. His daring and confident approach towards cricket is just like the 18 year old Sachin Tendulkar. The commentator Harsha Bhogle posted a tweet that he was very much pleased to see a young crop from Kerala play in such an inspiring manner. Ian Bishop also said that most of us would be frightened if Sanju had played in their era. Sanju will be an inspiration for a lot of young Kerala players as the selection committee will be eyeing for more talents from Kerala. All the young kids from south and fans bow down in front of him hopping there will be a great change from now.